Royce Bair is a generous teacher, adding new visions and insights to his blog on a regular basis. He specializes in what he calls "Nightscape Photography" and uses environmentally sound techniques to "paint" the earth's foreground features with light against an otherwise unseen brilliance of starlight in the Milky Way galaxy. The images speak for themselves, but the techniques are not as immediately obvious. Join Royce in the Grand Canyon for a workshop like you've never seen before. Western River Expeditions will cater to everything else you need with picture perfect professionalism and charm! There is not a 2019 Workshop with Royce Bair scheduled. 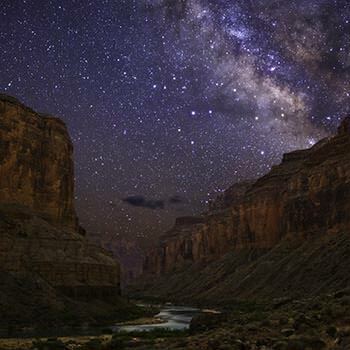 View a slideshow of Royce's inspiring nightscape photography.